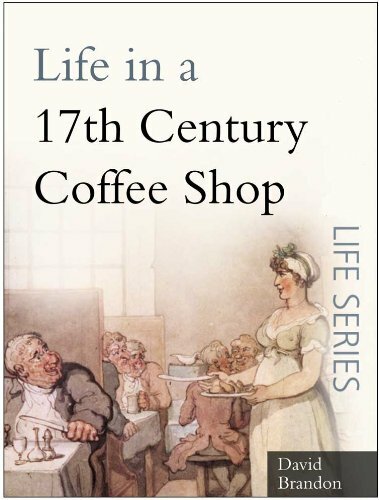 I just read Life in a 17th Century Coffeehouse by David Brandon and, by and large, I enjoyed it. This is a quick read as it is short (8 chapters and 90 pages long), but it is jam-packed with information and written in a very readable, entertaining style. The chapter on “The Everyday Life of a Coffee Shop” was especially interesting. It is interesting how coffee – what we now consider such a staple in our kitchen – used to be an exotic and strange beverage. I hadn’t known about The Women’s Petition against Coffee from 1674 which accused coffee of making husbands sterile and impotent! That’s all well and good, but with all due respect, Daniel Defoe would have been around five years old when the Plague was in London! (Before anyone says it, no, we do not know the exact date of birth but the general consensus seems to be 1660). Anyway, I think this lovely little book is perfect as an introduction to the world of 17th-century coffee houses. I’m a little disappointed that it slipped through my net before and most of what I know about coffee houses came from hours in the archives. So, take my advice and read this book FIRST and then go to the archives. 😉 I bought the paperback, and now I see that it’s on Amazon kindle for 59p! Seriously, buy it!